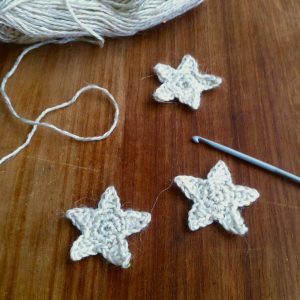 A new addition to my Etsy shop this weekend – a set of three gift tags with little crocheted stars. 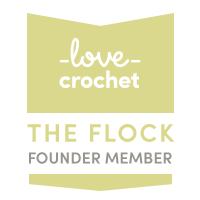 I think they’d be perfect gift toppers for matching bridesmaid’s gifts or wedding gifts. 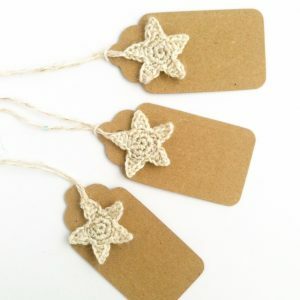 The lovely yarn I have used here, which is a hemp blend, includes tiny subtle pearlescent sequins, which are rather hard to photograph but make these gift tags extra special. The tags themselves are hand-punched by me from 100% recycled card. 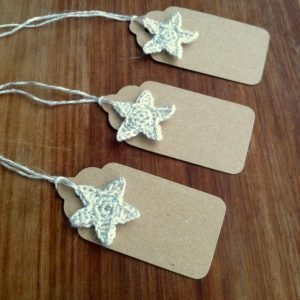 See these gift tags in my Etsy shop. 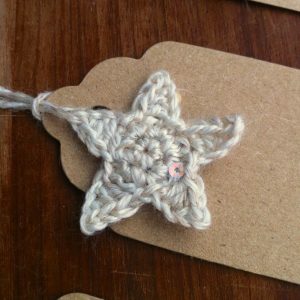 These are the first of a range of tags I’m planning to add to my shop, to include heart and little snowflake designs. If you have any suggestions, let me know!